And maybe we don't wanna stay the same "
E'rni is a little on the tall side, with medium-toned olive skin and dark brown hair that's mostly a mass of curls down to the small of her back. She keeps it out of the way most of the time, practicality outweighing her vanity. Her eyes are large, and a vivid greenish-hazel color. Her lips are full, and her nose a bit on the smaller side. She has heavy Thread scarring on her left forearm and the back of her hand. She carries herself well, almost looking down on people; her height helps with that some. She dresses not extravagantly, but quite well nonetheless. After all: she's found that people are more inclined to do business with someone who looks good. E'rni is a bright, personable, well-spoken woman who thinks almost solely of herself. She always wants more: more power, more money, more acclaim... but mostly more money. She's a spendthrift and an expert haggler, adept at getting a good deal out of others, and equally adept at selling things with almost no value for far more than they're worth. She sees just about everything as an opportunity to make more money, and often engages in get-rich-quick schemes. She doesn't like to share what she has, and does so only very grudgingly. She doesn't really think much of other people. She formed attachments once, but has found that people just... tend to go away. She's already watched half her Weyrling class die, and has no desire to actually care about anyone again. The only one she truly cares for at this point is Endarakth, and it's more a mutually-beneficial partnership: they're both manipulative at heart, though for different reasons. She refuses to engage in politics. There's simply no profit in politics, and so she stays out of it entirely. No sense alienating potential customers on one side or the other, and the extremists who would be offended by her refusing to take a stance are the tiniest of tiny minorities anyhow. Elarni was born a Trader, and for most of her early life she was pretty sure she would die a Trader. It was a good life, and she learned quickly the value of money. Money could get you anything. Respect and privilege was granted to those who had money, regardless of whether or not they had actually earned it. Looks could get a person pretty far too, but nowhere near as far as money. She grew up, a productive member of her community and good at what she did. Life was good. Other Traders lost everything to Thread, and a few had back during the war, but there weren't many people willing to mess with Pern's supply lines, and her caravan had been lucky. Things were good. She was occasionally frustrated by the fact that her own enterprises were overshadowed and overruled by the work of the entire caravan, but that was life. At least she was decently well off. It wasn't nearly enough, but it was better than nothing. And then the rider came to Fort Hold while they were stopped there. A rider on search, and her family saw a breaking of their group, but Elarni saw an opportunity. For who wouldn't respect a rider? Who wouldn't jump at the opportunity to buy goods from a rider? She could be rich. She could be powerful. If she got a gold, or even a bronze... Well, women didn't ride bronze, but she could. Even better, if she could be the first. Fame would make her life even easier. She eagerly stood at the Hatching, and was forced to watch bitterly as the first egg to hatch was a bronze, and did choose a woman, but another woman. Worse, a woman who'd been a Trader for a rival caravan. Elarni decided in that moment that she didn't like Esther, but if they had to work together, well, she'd tolerate the other woman. Her own chance wasn't long in the coming: a green hatched, moving gracefully. Until she made one ungainly leap to tackle Elarni to the sand. E'rni! Dismiss those thoughts of bronze and gold. They are shiny-hide morons. No, I am better. I will be better! Endarakth is here, and you will never be alone again. Now, feed me. Time passed both quickly and slowly. E'rni thought she was going to see the Weyr entirely collapse, with everything that was happening with High Reaches, and then Fort Hold, and then the plague, but the Weyr somehow survived it all. Her class didn't though. Over time she watched their numbers dwindle; people she'd actually come to like faded away, taken by Thread, or sickness, or in the case of Keramerth's rider a fate worse than death (not that E'rni missed her being around in the slightest; pitied her, more like). One Fall resulted in near-disaster, and she was badly scored on her left arm, but even that could have gone far worse than it eventually did. She healed, and flew Thread again, and again, and tried to steel herself against the disappointment of watching more people she knew die. In recent months, she's begun to question her decision to become a rider. Nobody ever told her about the inevitable heartbreak. FULL APPEARANCE: A larger green, Endarakth is hard to miss! She is sturdy and yet dainty, and walks with a very ladylike air. She always has her head high and is sure that everyone can see her. She has a certain elegance to her, and is far more queenly like glare to her eyes. 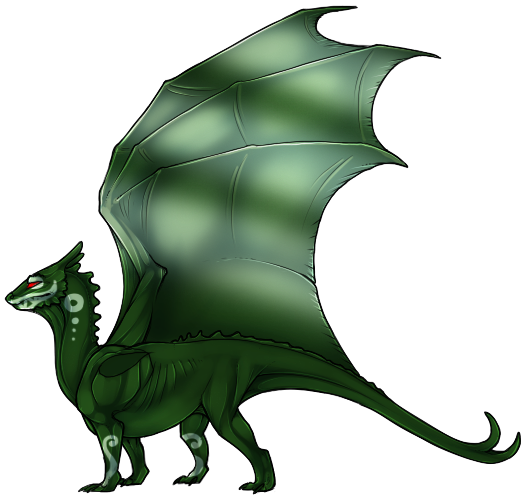 She is a a deep emerald green, with lighter, more seafoamy markings. She has teeth markings around her mouth, as if she has a larger mouth. She has the same seafoam over her eyes, and in large swathes over her wings. Her front left foreleg and her back right foreleg have light swirls over them, like vines crawling up her legs. Endarakth speaks like a confident young woman, in a strong soprano voice. She has no concept of pitch, and sometimes she shouts when she doesn't mean to. PERSONALITY: Endarakth presents herself as pretty easygoing and easy to get along with. She asks for favors with a sweetness to her voice, but she is quick to turn on others, and quicker to speak poorly behind their back. She thinks herself as much higher than she is, and will show no hesitation in bossing around everyone around her, especially browns and bronzes. She will even talk-back to Golds, but she will begrudgingly follow their orders, while saying unpleasant things about them behind their backs. She will never insult anyone she is trying to manipulate though, but she's not as good as Keramerth was. To her human, she will always be asking for favors. More oil. More food. More time hunting and flying. She will think of them as a partner, but she'll always see herself as the stronger of the two. It doesn't matter to her if she's liked, it just matters that people listen to her. She is fairly sure of herself, and her confidence knows no bounds. She liked to try to ally herself with Keramerth, but her plans are far less grandiose. She always will think of herself greater than the golds and bronzes, and her pride is legendary.